Reed has developed a network of support services that complement the academic program and help students to do their best. A robust peer-tutoring program, which includes free drop-in as well as individual tutoring, provides assistance to nearly 50 percent of Reed students. 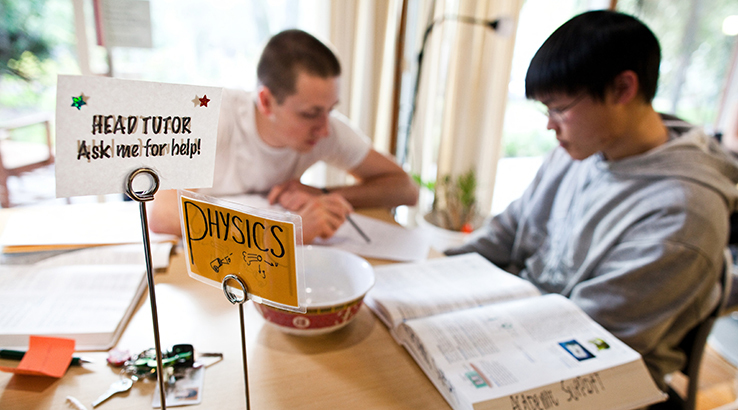 Up to one hour of tutoring per subject per week is available for many classes. Reed's tutoring center is located at the Dorothy Johansen House (the DoJo), which also has space for groups to study together. Workshops held throughout the year provide students with tips on time management, priority setting, and other topics designed to promote student success. Students can make an appointment to discuss study skills, quantitative skills, learning styles, test anxiety, procrastination, and academic stress. Also located in the DoJo, disabilities support services works with students and faculty to determine appropriate academic adjustments—which may include note-taking services, additional tutoring, or advocacy for extra time on papers and exams—for students with documented disabilities. Each student is paired with a faculty adviser at the beginning of the freshman year. This relationship helps to ensure, from semester to semester and year to year, that students are not only fulfilling their distribution requirements for graduation, but that they are pursuing an academic path they find meaningful. Students in Humanities 110 attend separate advising sessions about their writing. Once they reach the senior year, students are assigned a thesis adviser, as well.